The winner was chosen by random number generator. Lisa, I have sent you an email. sewed them end to end. Yep jelly roll race #3 of 6 is sewn. 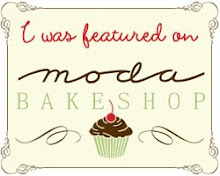 I used an older Moda line Blossom by Urban Chicks. I added a rectangle 2 1/2" x 4" to each strip. It gives it a more random modern look. 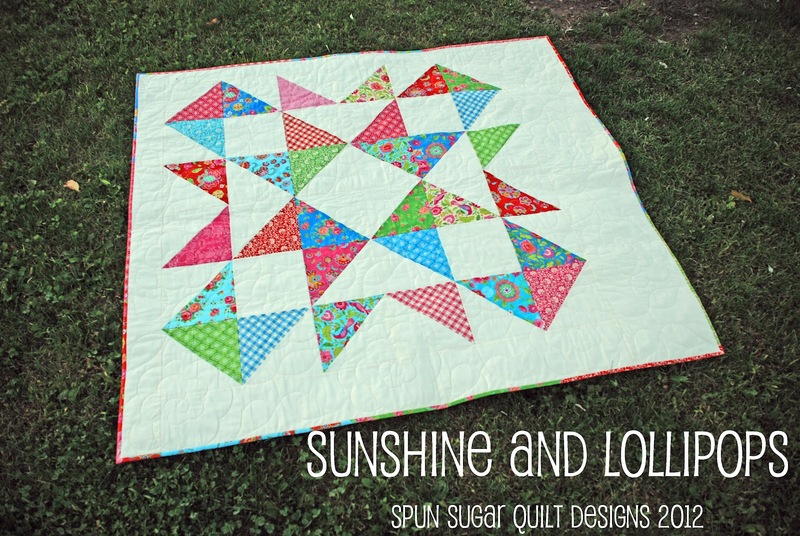 I am hoping to take this to the quilter this weekend. I am actually hoping he will have one of them done for me! I will have 6 quilts to bind by December 20th. Are you making Christmas gifts this year? I picked up my Square Me Up Too quilt from my quilter yesterday. It was sunny for just long enough for me to take a picture. Can you see the quilting from the back? It's cars, trucks and construction equipment. So cute on this fabric. I ended up using grey for the background instead of blue but it works. I also managed to tackle 2 of my most disorganized areas of the house. It took a HUGE load off my mind. I just always felt like my house was always dirty because of those areas. my bathroom cabinet and my youngest daughter's toy/play area. After that....hmm then the basement is the last frontier. Do you have any rooms/spaces or places that you need to organize? 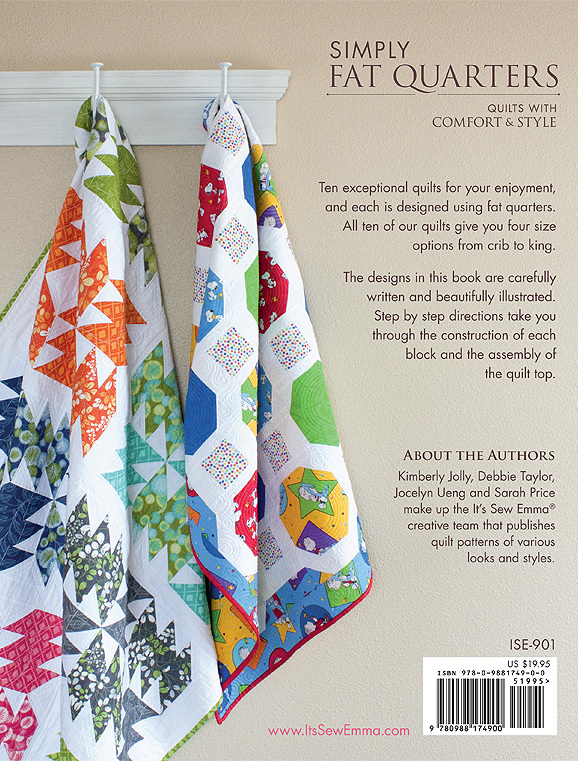 Last week I posted a giveaway for a copy of my two new pdf patterns. I chose the winner with online random number generator between 1 and 36. NM, I have sent you the pdf files. I was inspired to stitch something while we were on the plane to Las Vegas. Yep my husband and I went to Vegas for 3 days. 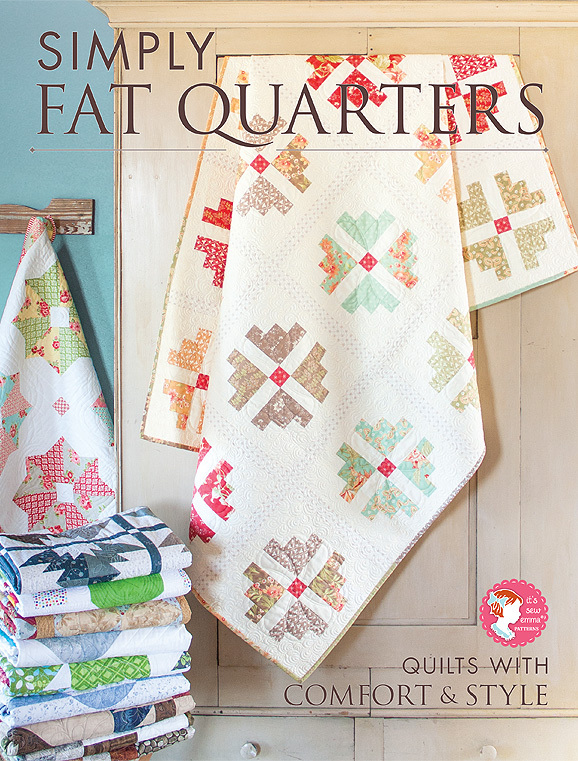 While we were there I stopped at 3 quilt shops. I picked up a bunch of text prints to add to my fabric stash. I ended up paper piecing. I absolutely love the text prints. I am officially on the band wagon with these. I also paper pieced this little flower. It was a great a great get-away. 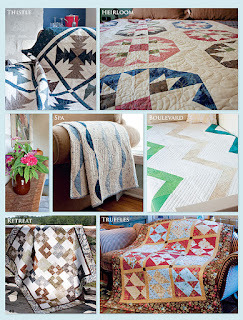 Okay I think I have an obsession with these quilts. This particular race took me just under 2 hours. 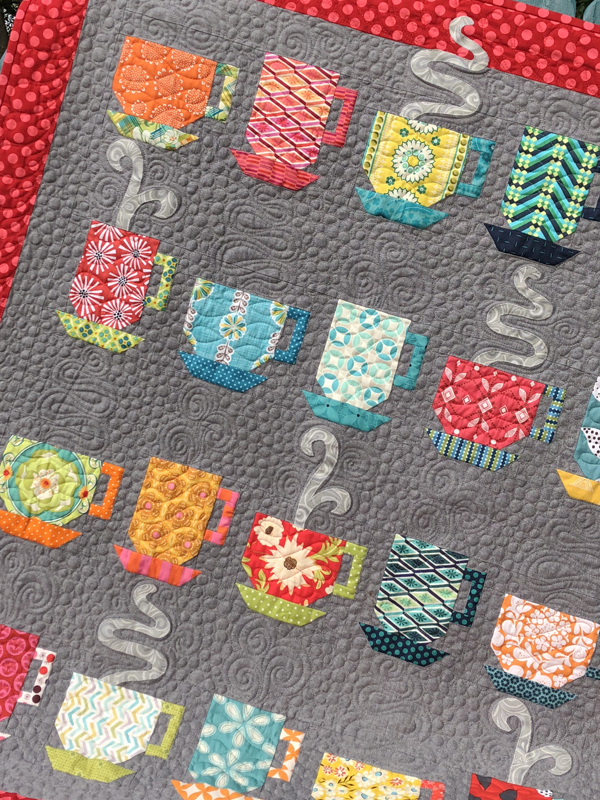 I added red Moda Basic Grey Grunge to the end of each jelly roll strip. This line is Urban Couture by Basic Grey. it was about time I used that jelly roll don't you think? Anyone going to try one of these? 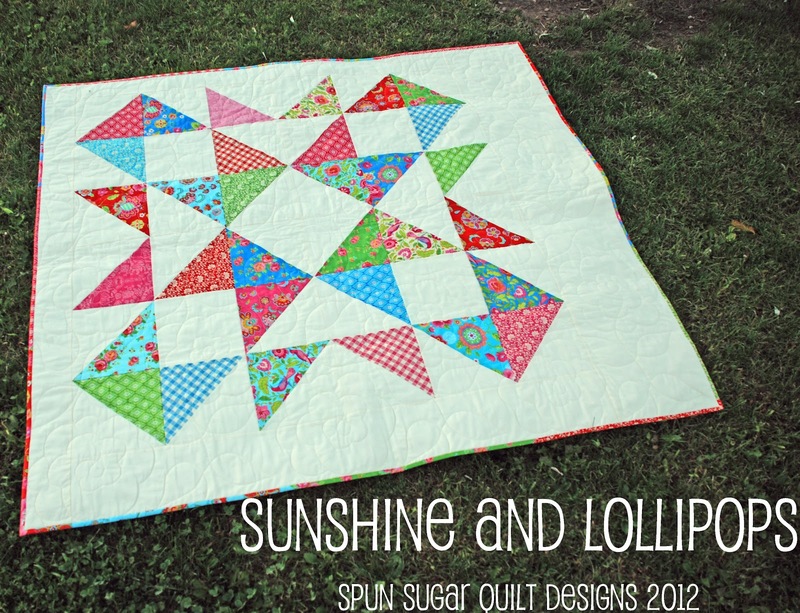 on my Sunshine and Lollipops quilt last weekend. and gives you a stunning result. I used Gypsy Girl by Lily Ashbury. although the pattern works best with a 10" layer cake. I used a bella solid that I found at J'Ellen's House of Fabric. Unfortunately, I don't know the bella SKU #. It coordinates pretty well with this line. 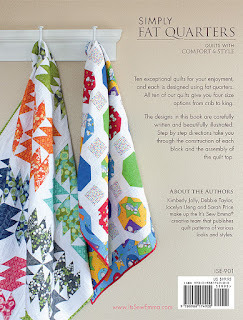 It will be on display at J'Ellen's when the new Gypsy Girl fabric line arrives. 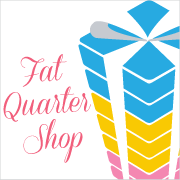 at Craftsy, Fat Quarter Shop and Patternspot. I will randomly select a winner on October 12th. 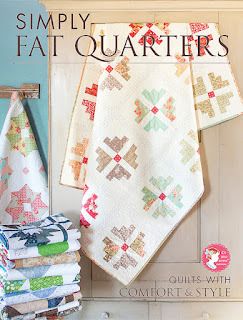 Some of you have probably heard of the jelly roll race quilts aka 1600 quilt. Well I hadn't paid much attention to them until I saw one pinned about a month ago. I got this hair brained idea to make one for each of my staff this year for Christmas. I started my very first one with Fig Tree fabric. 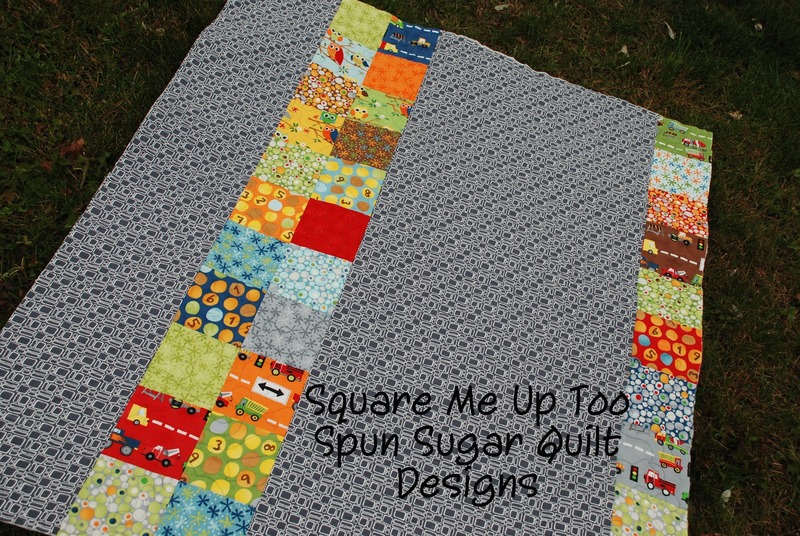 It's actually 2 1/2" strips that I had left over from 2 quilt projects. Some of the strips had bits cut off but for the most part they were intact. I started by sewing the ends together on the 45 degree angle like I make my binding. This left me with one continuous strip of 2 1/2" x god knows what? 1600" maybe. and lay them right sides together along the LONG seam and sew down the side 1/4" seam. you come to the end loop which you cut in half and finish sewing your seam. Here is a part of my strip after 2 rounds. I pressed each time I sewed. As you sew your strips together your length gets cut in half and the width doubles. Here's my finished quilt top. I absolutely love how random it turned out. And it was sooo easy. Given that it was my first try at this, it took me 2 hours to sew it. I have already taken it to my quilter and only have 5 more to go. even though they are based on the same principal. 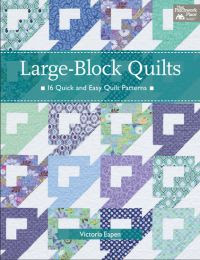 I will post each top as I complete them so you can see how adding squares, sewing straight edge instead of angle or adding rectangles will change the look. The truth is, is that even I don't know what the result will be.